No question, 500-passenger Europa 2 is one of the most lovely and well-designed ships afloat. Its contemporary good looks, museum-quality art and chic furnishings make it feel more like a luxe European boutique hotel than a cruise vessel. 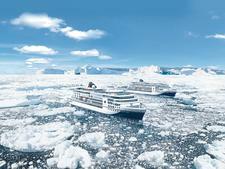 Hamburg-based Hapag-Lloyd Cruises aimed for a resort ambience with this ship, to cast a wider net beyond veteran cruisers. The 11-deck vessel, which launched in 2013 and was refreshed in dry dock two years later, marks a radical departure for Hapag-Lloyd. It's less formal and more family-oriented than Europa, the company's flagship luxury vessel. 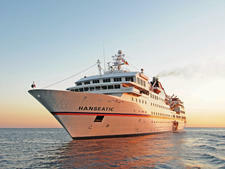 Europa 2 also aims to attract English-speaking cruisers from beyond its German-speaking base. Unlike Europa, all voyages on Europa 2 are bilingual, with virtually everyone from servers to cabin stewards and lecturers able to speak English or provide translation. Europa 2 is sleek, featuring high ceilings, dramatic cylinder-shaped light fixtures and generously sized windows in its spacious lobby bar/reception area. However, other public areas are more intimate than grand, and Europa 2 doesn't feel crowded. Hapag-Lloyd says the ship boasts the industry's highest ratio of public space per passenger. No fighting over deck chairs or a seat at the bar. Cabins, called "suites," all have balconies and virtually all bathrooms are fitted with separate tubs and showers. Expense isn't spared. The ship features high-quality materials, silver-leaf ceilings, wide corridors and hand-blown Murano glass chandeliers. The Serenissima Italian restaurant is the only place where polished marble is used. Steel and limestone are incorporated throughout. Top German brands of tableware and deck furniture delight those with worldly tastes. The ship's nearly 900 pieces of original art are noteworthy, including works by Damien Hirst and David Hockney, as well as those of lesser-known contemporary artists especially designed for Europa 2. Ship highlights include four specialty restaurants included in the cruise cost, a bar boasting the largest collection of gin at sea, complimentary caviar nights and seven family-friendly connecting cabins, with kids' quarters stocked with toys. The Ocean Spa is a destination unto itself, with four sauna and steam rooms that are free to use, a relaxation area facing the sea, beauty salon, well-equipped workout area and a hideaway outdoor lounge area with whirlpool tub on Deck 11. Europa 2 is distinguished by the high quality of personnel who interact with the public. Save for room stewards, the majority are young and hail from Germany, Switzerland and Austria. Hapag-Lloyd says they are paid above-average salaries for the cruise industry. We chatted with many with university or hotel school degrees who were out to see the world, and conversations ranged far beyond the typical "Where are you from?" cruise-ship banter. Reception staffers are friendly, truly bilingual and smart, able to competently deal with problems such as Wi-Fi access. A server at the Yacht Club restaurant walked over to offer us an English-language newspaper, unasked. 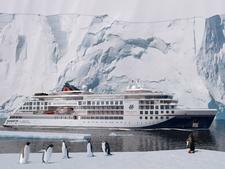 Hapag-Lloyd hopes international luxury travelers will make up more than 10 percent of Europa 2's passenger base, which now is just 7 percent non-German-speaking. You likely will hear little English spoken by passengers, though many can converse with you. Don't expect a party atmosphere unless a festive group is aboard. With its emphasis on anticipatory service, elegant surroundings, intriguing itineraries around the globe and commitment to offering English-speaking travelers close to the same experience as its core German passengers, Europa 2 is a strong player in the high-end cruising lineup. If you seek laid-back luxury, Europa 2 offers a superb cruise experience -- especially for those who like to mingle with those from another culture. 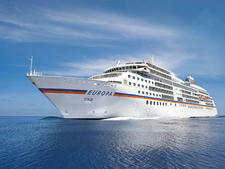 Europa 2's big passenger base is the well-heeled from Germany. Two-thirds of passengers are repeaters. The ship does attract some English-speakers, primarily from the U.K., Hong Kong and North America. On our fully booked sailing, 40 non-German travelers and just a handful of Americans were aboard. Passengers tend to be 40 and over, though you'll spot a younger demographic during European school holidays. There's no dress code, but passengers are usually smartly attired. Think upscale resort casual for daytime -- and we mean outfits that cost thousands of dollars, from names such as Bogner and Escada. (Ralph Lauren sportswear is considered low-end here, and the ship's boutique stopped carrying it.) There are no formal nights or captain's dinners. Evenings bring out expensive slacks and knee-length dresses for women, and sports jackets for men. The occasional cocktail dress is OK, but tuxedos or gowns are out of place on Europa 2. You can leave the ties and sequins at home. The onboard currency is the euro. Gratuities are included in all fares, but there are extra lines for them on bar and spa bills. Some passengers tip the hard-working cabin stewards extra at their discretion. Room-service waiters clearly appreciated a couple of euros or dollars per order. Americans who sail on luxury lines might be put off by the fact that alcohol is not included (save for beer in complimentary mini-bars and spirits in mini-bars of higher-level quarters). Except for a welcome bottle of French Champagne, bubbly at the breakfast buffet and some drinks offered at shipboard fetes, you will pay for cocktails and wine at meals. (However, the line recently introduced an onboard beverage credit of up to 200 euros in free drinks, depending on cruise length.) There's also a charge for water and soft drinks consumed outside your stateroom. Airfare and pre- and post-cruise stays are not included, but can be arranged. 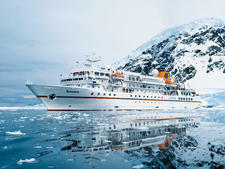 Those who book flights through Hapag-Lloyd get shuttled to and from the ship. Shore excursions cost extra.